People know very little about silhouettes. For this reason I like to include a little background information on the back of my silhouette cards. I do update this silhouette blurb from time to time, so here is the latest version. The basic concept has remained uncharged since the very first silhouette card I printed in 1989. At some events I often see people sitting about reading the backs of their silhouettes. I’m never sure if this is such a good thing or not. Was the party really a success? Hand-cut silhouettes possess a unique charm all of their own, often seeming to capture the essence of a person in amazing detail with the minimum of effort. Such shadow portraits, or shades, were hugely popular throughout England during Georgian and Regency times. A portrait silhouette should always be cut freehand, using only the eye as a guide. The name “silhouette” comes from Etienne de Silhouette (1709-67), the infamous Controller-General of France, who would amuse himself at drawing-room gatherings by cutting profiles from paper. In an effort to prop up the ailing banking system of the day he imposed a rigorous regime of tax rises and spending cuts. A popular joke of the day had it that the only portraits anybody could afford were cheap paper cut-outs made “a la Silhouette”. It was meant as a derogatory term. 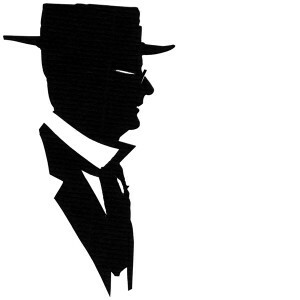 The craze for silhouettes died out in Victorian times with the arrival of photography; shades were suddenly old hat! Yet a few talented artists did continue the tradition throughout the twentieth century, and this little known English craft now seems poised to make a come-back. The silhouette cards are printed for me by Conservatree. They can be customised to suit each event if needed.